Pupils consider how Baptism by water and the Holy Spirit inspires believers to follow Jesus in Loving your neighbour as yourself. They consider the difference that developing the ‘fruits of the spirit’ make in helping a believer love others. For example they investigate what inspires Christians to serve their ‘neighbour’ overseas, through charity work or for example the Church of England ‘Diocesan Companion Links‘, e.g. Angola, London, Mozambique Association (ALMA) As a creative reflection or RE with Soul theme day, they create artwork on a theme which reflects their learning about Baptism in water and spirit and the difference that the fruit of the spirit makes to an individual or community. How does being Baptised into the Christian faith and having the help of the Holy Spirit enable a believer develop the fruits of the spirit? How does having the fruit of the spirit inspire a believer and help them to live out the commandment to ‘Love God and Love your neighbour as yourself’? What motivates and enables individuals and churches to love their ‘overseas neighbours’? To understand that the Holy Spirit helps a believer develop the fruits of the spirit. That the fruits of the spirit inspire and help a believer love their neighbour. How do the ‘fruits of the (Holy) spirit’ in a believer’s life help Christian believers share the Love of Jesus with others? The fruit of the (Holy) spirit are qualities that a Christian believes they can develop through the help of the Holy Spirit as part of the new life in Christ, through baptism. 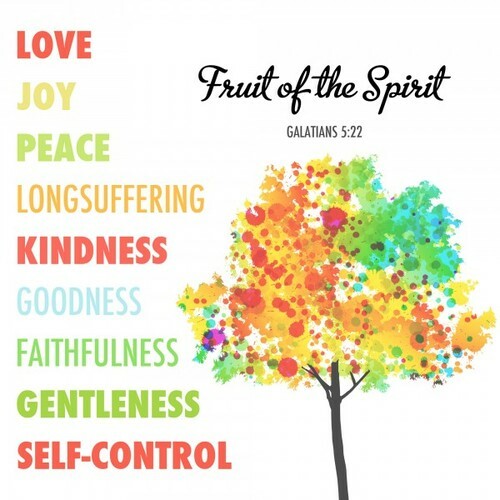 The fruits of the Spirit are: love, joy, peace, longsuffering, kindness, goodness, faithfulness, gentleness, self-control. See Bible Text: Galatians 5 v 22-25, where the apostle Paul, as part of teaching to the early church in Galatia, encourages believers to develop these ‘good’ fruits of the spirit and to turn away from bad fruits. Ask pupils to think, pair and share with their neighbour about examples of loving people that they have experienced, and what qualities they have shown through doing these, that reflect the fruits of the spirit? What helps us to love people?, e.g. do acts of kindness, show patience, self-control etc. Think of an example of helping an individual, the class, your family, a neighbour, communities overseas e.g. charity event? Consider school values and ethos – how do they reflect the ‘fruit of the spirit’? How do we develop these qualities as individuals, in our class, in our school? What difference can developing the fruit of the spirit make to the way Christian believers show love or offer the ‘water of life’ to others? The idea of Loving God, and loving your neighbour, is widely explored in religion. What we believe about our neighbour and understand about what it means to love people, has an impact on how we live. Arrange to visit your local church (or a Christian charity) to find out about members of the church or charity love their neighbours – individually, locally and globally. Introduce the concept of ‘loving your neighbours overseas: recall the charities explored at the beginning of the unit. Churches have always had their own overseas links – loving their neighbours. What difference have these partnerships made to ‘our neighbours overseas?’ E.g. food aid, water aid, responses to environmental disasters. If you were organising a campaign for ALMA to show love your neighbour following Jesus example –what strap lines would you include in your poster to inspire and motivate people to take action? e.g. campaign for cleaner water, or help buy water pumps. tree 3 how ALMA/a charity helps people loves others overseas. See ALMA ‘River of life’ hanging for an example of a gift made on this theme for a church in Mozambique. « Activity 4 - What is Baptism in the Holy Spirit and the difference it makes?